Posted 9/16/09. Last Thursday, I received my first dose of a new (to me) intrathecal chemotherapy drug, and a drug to prevent blood vessel growth, hopefully choking-off nutrients and oxygen to my spinal tumor. The new intrathecal chemotherapy drug is methotrexate. As I mentioned in my "Irony" post, it needs to be given twice per week because its effectiveness doesn't last long. It looks like Mountain Dew... Maybe that's why I don't sleep well... No, actually I have been sleeping well since I have been off steroids. 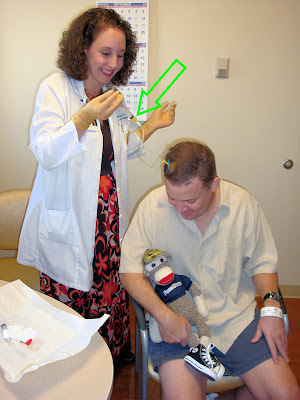 Methotrexate is administered relatively fast, in about 5 minutes. On the contrary, the drug that prevents blood vessel growth can take several hours. Last Thursday, the initial dose took about an hour and a half to receive intravenously. Luckily, it only needs to be delivered every two weeks. Yes, the intrathecal chemo is delivered via a port in my head, and the anti-blood vessel drug is delivered via port in my chest. To administer it, a pump controls the rate at which I receive it. Big Monkey inspected the pump before had to make sure it was working properly, shown below. Any drug that takes a long time to administer tends to be delivered at Moffitt's Infusion Center. Like the rest of Moffitt, it is very nice. You can read, watch TV, sleep, or just sit there during the drug delivery. For example, we were there late last Thursday, and watched some of the NFL Kickoff show from Pittsburgh (my home town). Of course, nurses execute and monitor drug delivery. It has been a comfortable experience for me when I have been there. Internally, I am not doing so well. 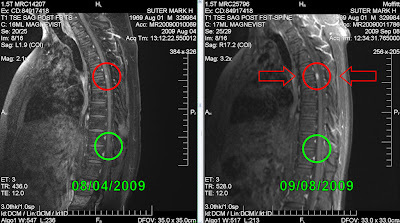 An MRI on August 4th found another tumor on my spine, and my doctors decided to give me some time off from treatment. Well, an MRI on September 8th, found that the tumor did grow as expected, and the disease (cancer) has spread into my lumbar (lower) spine. I was given four different treatment choices. I chose to receive a different intrathecal chemotherapy drug (methotrexate), and a drug that is supposed to inhibit blood vessel growth that may cut off nutrients and oxygen from the tumors. Methotrexate is administered twice per week as its effectiveness doesn't last long. The drug that prevents blood vessel growth is administered once every two weeks, and can take several hours to deliver. At first, this post contained more information about disease spread, but I want to confirm more facts before I post them.